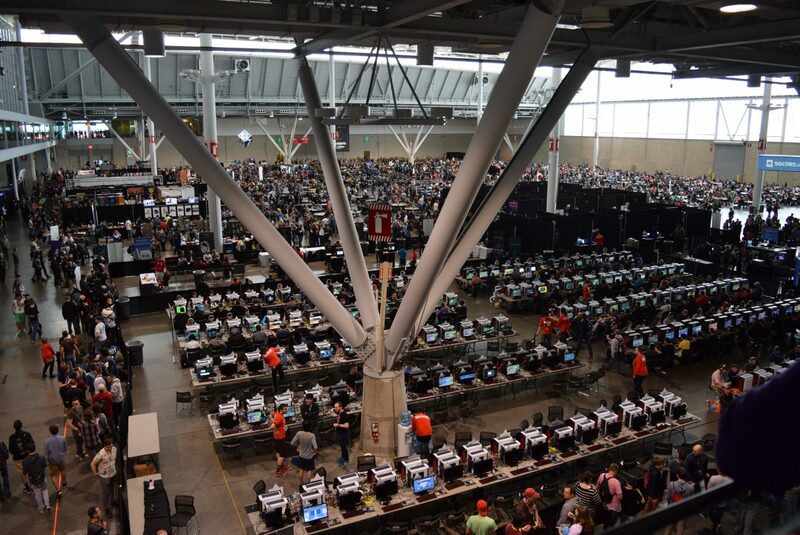 This year, Gameosity had a chance to go to PAX East! For three days, we scampered all over the Boston Convention & Exhibition Center, filling up our brains with as much of the shiny goodness as we possibly could. On full display was the grandure of our collective geekdom, bringing in sights and sounds (though thankfully precious few smells) from video games, board games, tabletop roleplaying games, cosplay, figurines, and all sorts of other odds and ends. It was awesome! The back half of the convention, beyond the triple-A video game wall. See that massive crowd in the back? That’s the tabletop section! Sticking closest to the subjects dearest to our hearts, we spent a huge amount of time wandering through the board game and tabletop section of the convention. We saw a *lot* of great titles and met some really cool developers, far too many to cover in one article. But we did come away with some moments of awesomeness which we wanted to pass along to you folks! 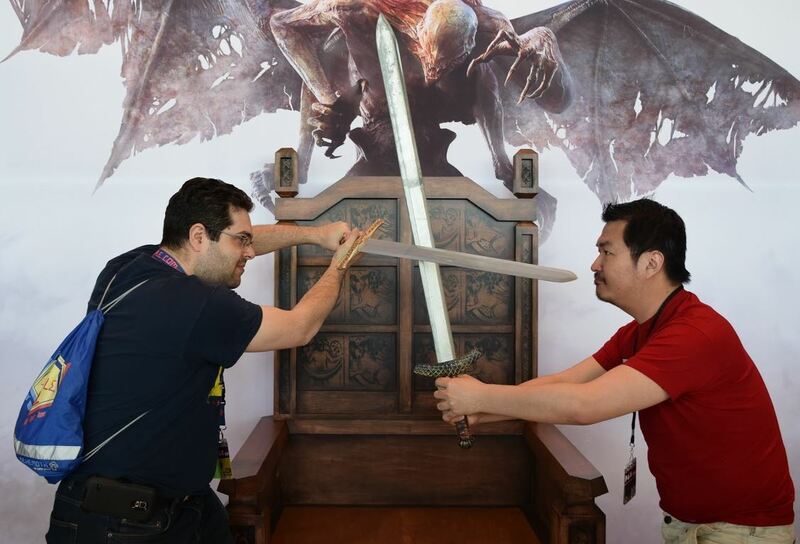 So, in no particular order, here are ten highlights from our trip to PAX! Dragoon is an area control game from Lay Waste Games. The product of a very successful Kickstarter campaign, we first saw Dragoon at New York Toy Fair earlier this year and it immediately caught my attention with its stylized artwork and presentation. 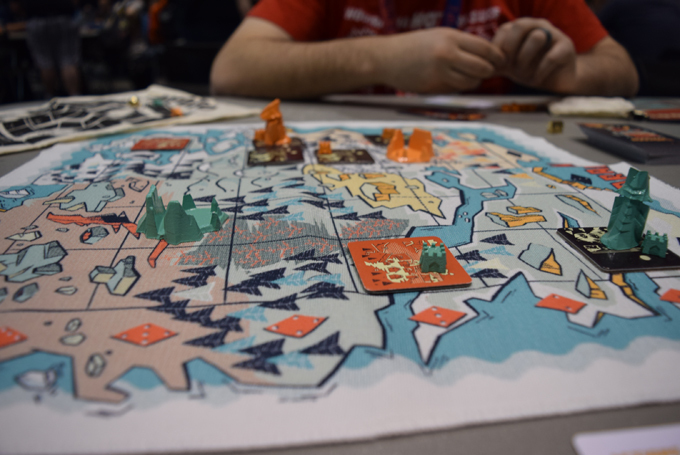 In Dragoon, 2-4 players take on the roles of dragons, stomping around the map, claiming (or destroying) towns, and generally trying to amass the most impressive horde possible. The gameplay itself is straightforward and accessible, the bits are delightfully heavy (everything that isn’t a tile is made of metal), and the care which Lay Waste Games put into its design and production helped me justify the (admittedly pretty steep) price-point. Jess: I really got a kick out of the visual presentation of Dragoon, and once we got a chance to sit down and play it, I was pretty well sold! Dragoon isn’t in retail right now, but you can order it directly from Lay Waste Games here! Jess: I took college Japanese for a few semesters and I remember… almost nothing. I played a lot of Magic around the same time and I can probably name almost every card in my Angels deck. Do you see an issue here? Like many people it is easier for me to learn something when I have something physical to play with. 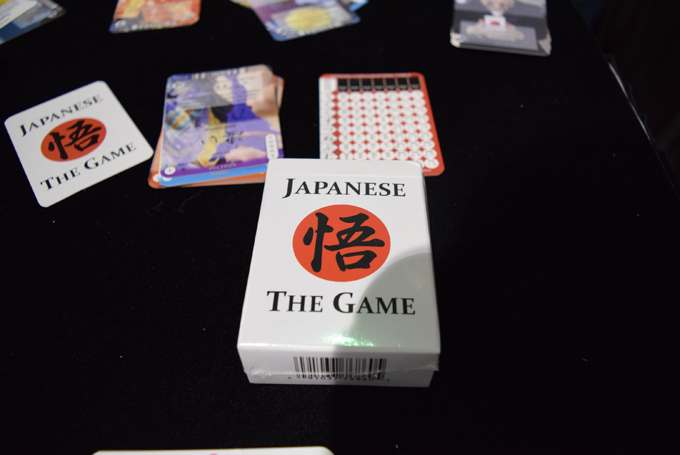 Japanese the Game is just that. It creates a tactile experience that makes learning easy. Using colors to differentiate parts of sentences, you can easily mix cards to create whole thoughts. Each card teaches you vocabulary as well as grammar. I had to buy a pack when I saw this game, but there are a ton of expansions as well. I think games like this are a great addition to any classroom. As Jess so passionately put it in her recent article, we think Larklamp, from Lumo Azumo is as much a symbol of the innovative direction board games are going as it is a game console. We got to catch up with P.D. Warne, designer of the Larklamp and test out the first game for his shadow-and-light board game system and the potential it represents is immediately apparent. Andrew: Like the widely vaunted 504 before it, I think Larklamp is going to be a unique piece of board game history. Whether it itself becomes an often-engaged part of the library is yet to be seen (like any game console, it is only going to be as good as the games designed for it), I truly think it represents an exciting step in modern game design. The Ja!s have it!…but we ended up Fascist anyway. Secret Hitler did something I didn’t really think was possible – it got me excited about a hidden roles game. I know that it’s sorta blasphemy, but the truth is I don’t really enjoy playing Werewolf or its kin (though I do enjoy running it). Resistance circumvents some of the issues I have with Werewolf (and Resistance: Avalon is even better than that), but, honestly, I am just burned out on hidden traitor deduction games. I guess it doesn’t help that Jess always kills as the traitor. 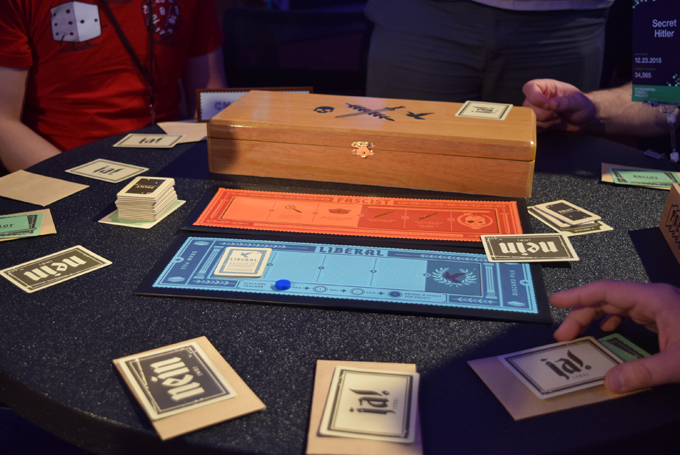 But Secret Hitler is light, accessible, and, above all, refreshing enough that it reinvigorated my faded interest in the genre. Each round, one player is the President, who in turn nominates a Chancellor. The assembled party votes on whether they trust that pairing, and then the President draws 3 policy cards, buries one, and hands the remaining two to her Chancellor, who enacts one of her choice. Several of these policy cards are Liberal, the kind of policies which will lead Germany, and the world, to a peaceful, prosperous future. Many more, however, are Fascist; the kind of policies which, well, only a lizardman would love. Have we mentioned that Hitler is a Lizardman? Andrew: As I mentioned, the role deduction genre is a bit stale for me. But honestly, I had a lot of fun with Secret Hitler, and yes, that phrase makes me slightly uncomfortable. Jess: That’s lizard fascist talk, you know. The Banner Saga is an absolutely gorgeous turn-based tactical video game, and its sequel just hit the market. Both feature resource management and brutal no-win scenarios, forcing players to make tough choices as they strive to keep their clan alive. Awesomely, we have a tabletop version in our future. 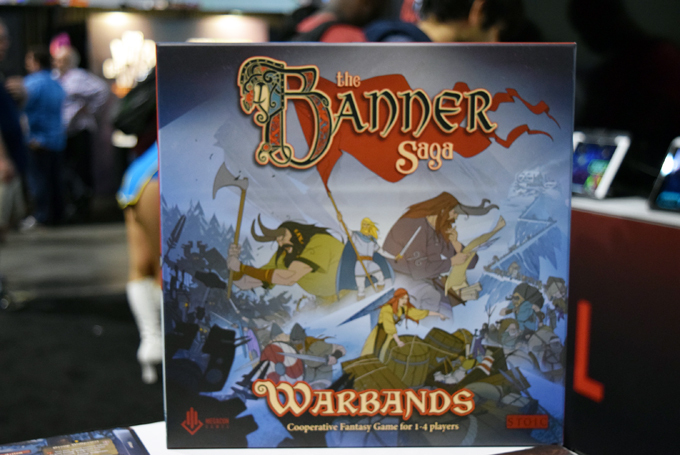 Published by Mercs, LLC, The Banner Saga: Warbands is a cooperative game of, well, tactics and resource management, which will focus on, you guessed it, tough choices that the players will have to make as they try to get their clan across treacherous territory and past dangerous foes. Andrew: One of the sources of conflict in the game’s design is that each player will take on a different role within the clan (quartermaster, warrior, etc.) and each choice made will always be at the expense of a player’s resources. This push-pull is bound to make some really tense table politics. We just all need to remember we’re on the same side – no lizard fascists need apply here. So, this is a pretty general topic, sure, but we got to see many examples of board game licenses being adapted to digital platforms. This included an arcade cabinet for Super Dungeon Tactics (more on that soon! 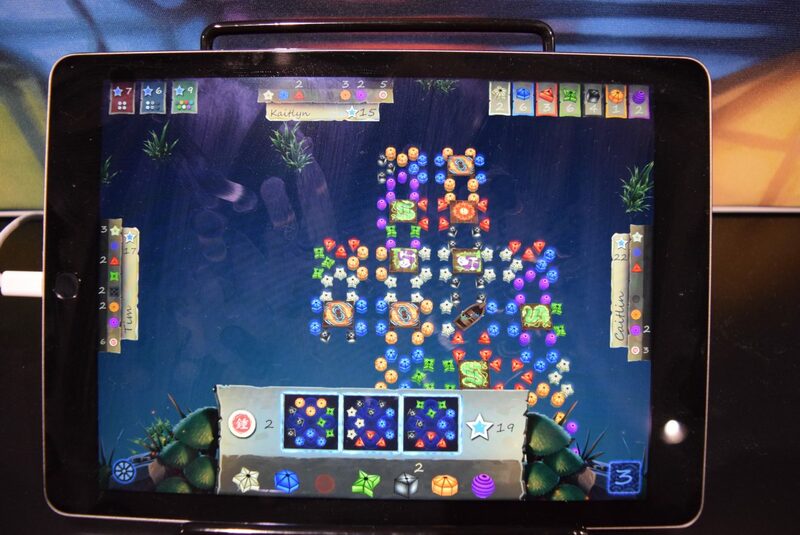 ), several tablet adaptations of popular board games (Lanterns looks gorgeous on the tablet; my hastily-shot photo does not do it justice), and even a sneak preview of a few cross-platform titles that will make it possible for you to play board games on the go, with friends across the world, and even laying in bed. Andrew: There may be folks who think negatively about this, seeing as how the social aspect of board games is one of the best things about it and, by converting games to digital platforms, it might make them seem to turn towards the solitary nature of many video game experiences. However, I think the opposite is true – the more accessible our favorite games become, the more people will be able to enjoy and appreciate them. Jess: Yeah! More games is always a good thing! And as multiplayer platforms get more refined for these titles, you’ll be able to play games with far-flung friends and even folks you make friends with across the net! And people who poo-poo that are just silly. Ok, so this one is really exciting for us – Betrayal At House On The Hill is one of our favorite thematic horror games. The original features 50 random scenarios, lots of spooky atmosphere, and my favorite traitor mechanic in any game I’ve ever played. Widow’s Walk, due out in October of this year, is a huge expansion, doubling the number of haunts, increasing the number of Omen, Item, and Event cards, adding lots of little quality of life improvements, and even a whole 4th floor to the mansion! Jess: We’ll be doing a full write-up of this one soon, but we just couldn’t resist mention it here – it was awesome! Andrew: Uh, spoilers, I guess? 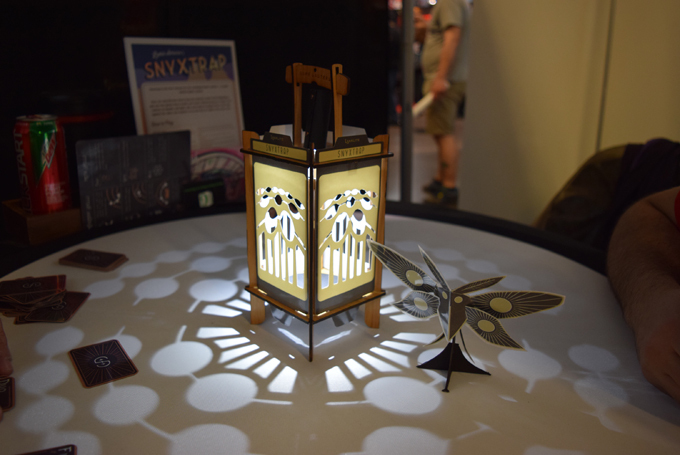 Wyrmwood Gaming makes amazing dice boxes and towers, but at Pax they stepped up their game (hah). They partnered with Take This, an organization that works to educate people about mental illness and prevent suicide. In their Box of Hope, Wyrmwood offered a gorgeous, wood version of the Take This shield as a reminder of those who succumbed to their emotional issues and to make sure we remember to care for ourselves and each other during hard times. The Box of Hope cost $20 and all the proceed went to support Take This’ mission to destigmatize mental illness and remind anyone suffering that they are not alone. Take This also offered an AFK Room during Pax for anyone who needed a safe, quite space to relax. All in all it was heartening to see and we had not heard of Take This before, so it was awesome to lean about the organization. White Wizard, the minds behind Star Realms (one of our favorite games around) are soon going to be dropping a medieval fantasy game upon us, and we couldn’t be more excited. Hero Realms works with the core mechanics of Star Realms; deck building, four factions, ally bonuses, etc., making it immediately accessible for anyone who has some experience with White Wizard’s fantastic sci-fi title. However, Hero Realms is way more than just a reskin; the balance is tuned more aggressively (if you can believe it) and White Wizard has a lot planned for it, like campaign play, 1 vs many boss encounters, and character decks (all, of course, in the prototype stage, so things may change). We got to play a full game of it and will be doing a write-up soon, but we couldn’t resist giving it a mention because it was awesome! This last one may be seem like a bit of a cop-out, but, honestly, we were just thrilled to get to spend time with so many awesome folks this past weekend! The tabletop gaming area was incredibly big but also really friendly, with gamers who had never sat together before happily playing games of all kinds. Everyone we talked to was enthusiastic and pleasant. 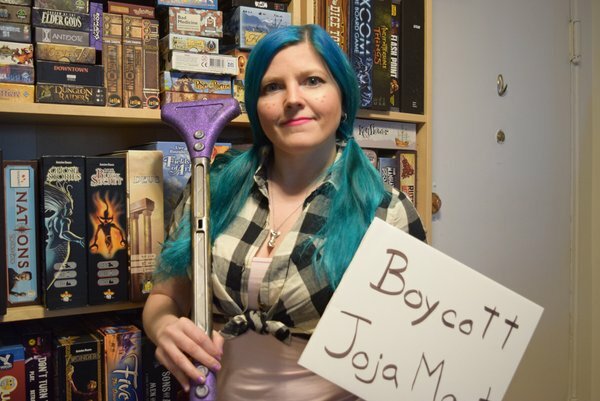 It really is a great time to be into board games, because there are more people than ever who are getting into our hobby! Let’s keep working to make everyone feel welcome, safe, and happy at our tables (even when some of those people are secret Hitler Lizard Fascists). So that was our PAX experience in a nutshell. What about you? Were you at the convention? What were your favorite moments? Did you see Jess cosplaying her Stardew Valley character? Let us know! 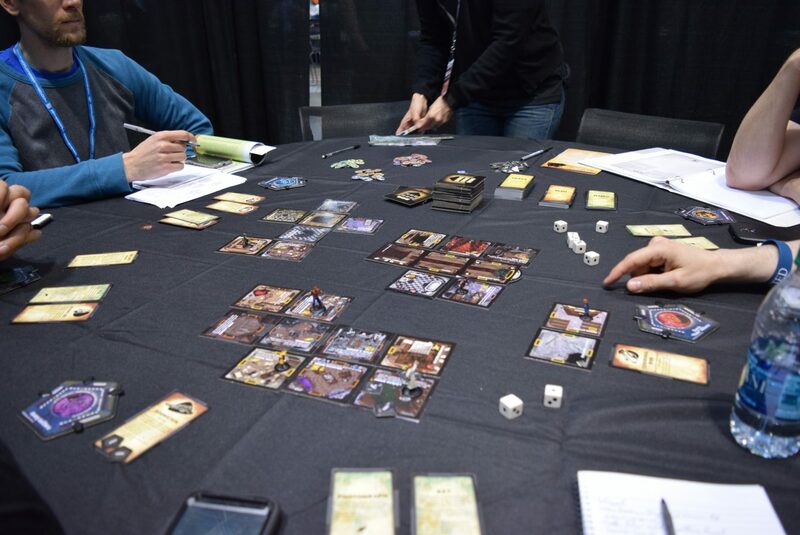 Next Post:Pax East News: Super Dungeon Explore Goes Digital!